With a whole world of adventure activities out there for you and your family, what makes a family rafting adventure so special? So often, trips are planned with adults in mind and don’t cater as much for what the children want and perhaps you want for your children, a learning experience. Water By Nature has family friendly trips on offer on the Ahansel River in Morocco over the Easter School Holidays. 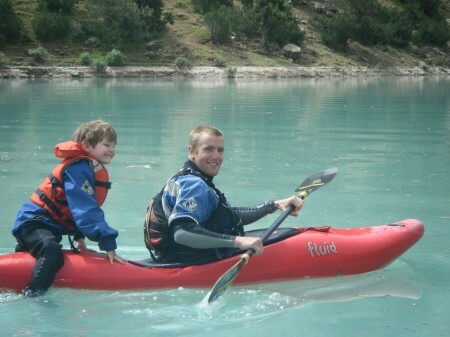 Far from being just a rafting trip, we’ll teach your kids about the outdoors. How to respect it, how to live off it and how to work with it. We always have an extra guide on the trips dedicated to teaching the kids new skills. They may get to bivouac out for the night (not too far from camp, but it will certainly feel like an adventure) with materials just found in the area. They’ll be able to try their hand at fishing and even learning to gut and fillet the fish. Take a visit to the local school and as well as teaching the local children English, yours will get to try French, or even funnier for them, Arabic! They’ll be inspired by our team of family friendly guides from all over the world, who will amaze your kids by baking such dinners as pizza and cakes on an open fire. Alternatively, we also offer some amazing family friendly rafting in Turkey on the Coruh River when the river is low, the weather hot and sunny. We give the kids a chance to guide the rafts, giving them confidence and inspiration in the outdoors. As a father myself, our kids, Holly and Josh are always in the outdoors and especially on rivers. At 4 and 2 respectively, they already love it. We have a minimum age of 10 on our family trips, but do take kids as young as 7 if they are a reasonable size and confident. Teenagers also love the trips and the kids do tend to keep each other amused and with the guides looking after them too, you do get a much needed break as well! For an amazing family adventure with a difference try a family whitewater rafting holiday in 2011. Hitchhiking on the back of the safety kayaker!